SiteW helps you appear in the first rankings. The registration of your website on Google is done automatically by using the information sent by SiteW. Every 30 days, if your website has been modified, we warn Google so that it visits your website and updates its data about it. If you subscribed to the Premium, E-Commerce or Pro package, we warn Google (and 12 other search engines) every time you publish your website. 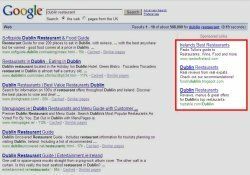 Once Google has been notified, your website is read before being added to its index. The Premium, E-Commerce or Pro packages also offer detailed and unlimited statistics, to analyze the origin and the keywords used by your visitors. You can find all the advantages of these packages (Domain name, more pages, more designs, more blocks, ...) on the Packages page. and increase traffic towards your website. to maximize your return on investments. and control your advertisement budget. Your website Google integration or update can take time (several weeks). That's why, to ensure an immediate visibility, you can display your website as a commercial link (displayed on the top right of search engine results).